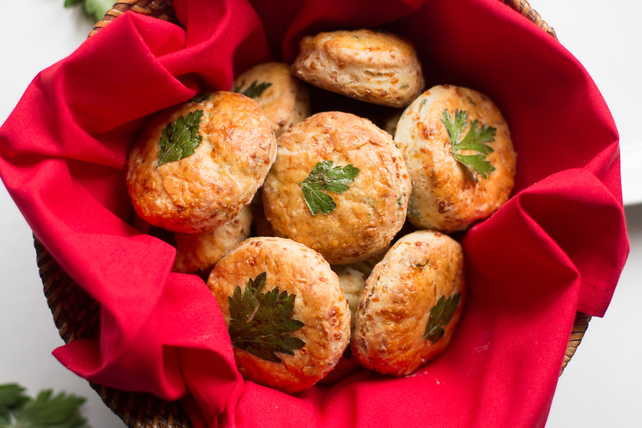 Add a special touch to your table with these simply delicious biscuits - the parsley garnish adds an elegant touch. Preheat oven to 425°F. Mix flour and baking powder. Add cheese and herbs; stir until combined. Cut in cream cheese product with 2 knives or pastry blender to form crumbly mixture. Stir in milk until mixture forms dough. Place dough on lightly floured surface; knead 10 times. Pat into 1/2-inch-thick circle. Cut with 2-inch cutter dusted with flour. Place on baking sheet. Brush each lightly with beaten egg. Top each with 1 parsley leaf; lightly brush again with egg. Bake 12 to 15 min. or until lightly browned. Serve warm. These biscuits can use whatever herbs are in season, or can be changed to go with the main dish!